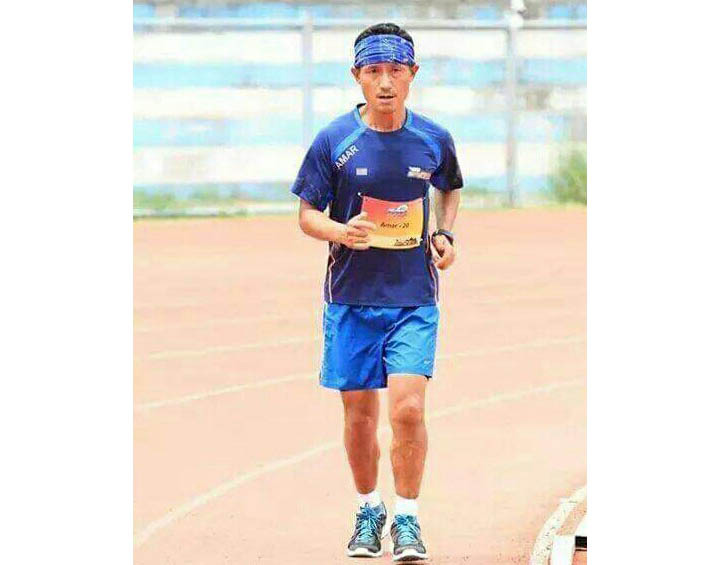 Marathon Man of Sikkim, Amar Subba left on Wednesday for his new challenge of 12 Hours (Night) Stadium Run to be held on 26-27 May at Gachibowli Stadium in Hyderabad. The run will start at 7 PM on 26 May and will continue for 12 hours till 7 AM on 27 May. The event is being organized by Bangalore-based Non-Stop Entertainment Business [NEB] Sports and only selected long distance runners of the country participate in this ultra marathon. 50-years-old Subba is participating in 12 Hours Stadium Run after a gap of three years and this is his first Night Run competition. In his debut 12 Hours Stadium Run at Bangalore in 2014, he covered a distance of 96 KMs in 12 hours and came third. Then, he came fifth in another 12 Hours Stadium Run at Mumbai in 2015 by covering a distance of 95.6 KMs in 12 hours. He also participated in 24 Hours Stadium Run at Bangalore last year but had to leave the competition incomplete due to injuries. “This is a new challenge for me to run whole night. The competition will be very tough among best ultra marathon runners of the country. I wanted to break my own record of 96 KMs in 12 Hours this time to finish in top three places in the competition,” Subba said at a press conference in Gangtok. He has undergone 10-days rigorous training for the competition. At the final practice, he covered the distance of 60 KMs in 12 hours in uphill route in West Sikkim. He expressed his confidence to do well in the competition to make Sikkim proud. “I have been continuing my running mainly to encourage young generations to come into any sport and to live a healthy life,” he said. Subba thanked the organizers for inviting him. He also thanked all his supporters and well wishers for their continuous encouragement.